BOSTON — With temperatures dipping into the 40s, numbing their fingertips as they tried to grip the baseball, Justin Verlander and Chris Sale both struggled to get the ball over the plate. The teams combined for just eight hits, but Red Sox pitchers walked 10 and hit three batters. Verlander walked four — tying a career post-season high, and more than he had in any outing in the regular season this year. Three of them and one of his two wild pitches came in a fifth inning that almost chased him from the game. Verlander pitched six innings of two-hit ball , and Carlos Correa fisted a single into left field to break a sixth-inning tie. 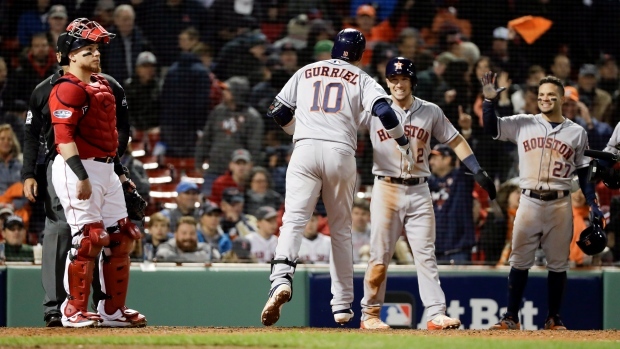 Josh Reddick hit a solo homer to lead off the ninth , and Yuli Gurriel curled a three-run shot into the front row beyond the Pesky Pole to give the defending World Series champions their fifth straight post-season victory. Game 2 of the best-of-seven series is Sunday night, with Boston left-hander David Price trying to end his post-season skid against Astros righty Gerrit Cole. Cora has expressed confidence in Price, a Cy Young Award winner who is 0-9 in 10 post-season starts, and the 108-win Red Sox will need him to be better than Sale was in the opener. Verlander was charged with two runs and four walks while striking out six. He has allowed only nine hits in his past four post-season starts, matching Don Larsen (1955-57) as the only pitchers to allow nine hits over a span of four-post-season starts, according to STATS. Price, 16-7 in this year's regular season, has two post-season wins in relief in his career. Cora insisted that he had faith in Price, and he told the 2012 AL Cy Young winner as much after the Red Sox eliminated the Yankees in the previous round. "Alex told me before we even got off the field that night" that he would get another start, Price said before the game. "So for him to tell me before we even took our jerseys off to put on our post-season shirts that we get when we win, that was special."